Earlier today WSO2's Jonathan Marsh, Director of Mashup Technologies, was on stage with Microsoft's Greg Leek, Director of Connected Systems Division during Bob Muglia's keynote at TechEd IT 2008, to demonstrate how interoperability is real between some of WSO2's open source technologies (WSF/PHP and WSO2 WSAS) and Microsoft's WCF. This was done by demonstrating plug-n-play between different implementations of pieces of the Stock Trader interop application, originally defined by IBM. You can watch the keynote here. For us in WSO2, interoperability is everything. The main value of XML, the Web and Web services comes from being able to interoperate seamlessly between different systems. 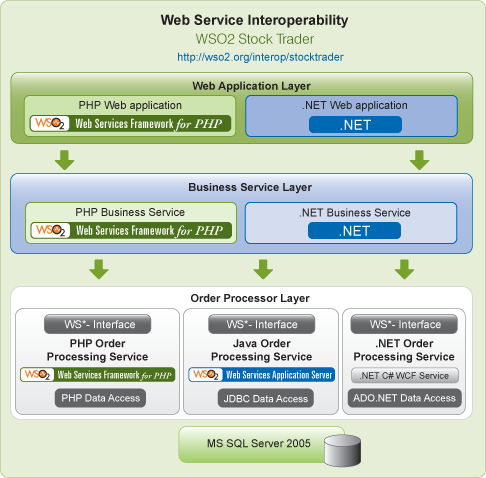 Web services is in fact the first ever platform that ALL vendors have agreed to as a single common platform for interoperability. Yes of course there are lots of minor and (some) major quibbles, but for the first time Web services have achieved what no other integration technology (CORBA, J2EE, DCE etc.) was able to achieve: get the entire computing industry to agree to a single set of integration protocols. While the standards process for Web services is now nearly over, the real problem of ensuring that everyone's bits work with everyone else's bits is still not done. What happened with this demonstration was that WSO2, the leading open source SOA vendor and the brains and brauns behind many of Apache's Web services projects, and Microsoft, the leader in defining the Web services platform, got together to show that this stuff really does work :-). Are we done? Far from it. It took many many years of hard work before every TCP implementation interoperated with every other implementation. There's no doubt that it will take more time and effort to get every single implementation to interoperate seamlessly. However, this is a great start as the leader in open source Web services and the originator of Web services demonstrate that things really do work. If you'd like to download the actual bits and give it a whirl, visit WSO2 Oxygen Tank and MSDN.